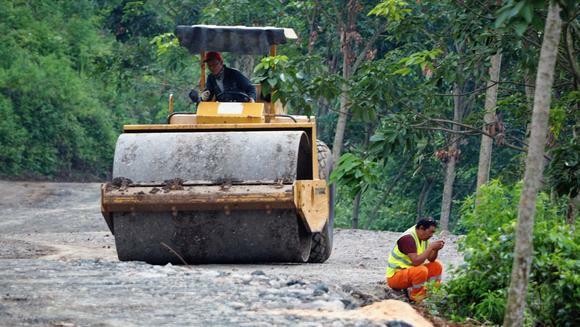 Indonesia : The route for Indonesia's first high-speed railway may be extended by roughly 60km to reach airports, despite major construction delays that raise concerns about completing even the original project. The railway was designed to provide a 45-minute link between Jakarta and Bandung, the provincial capital of West Java. But the planned 140km line may be rolled out further to just over 200km, as the government looks to add links to the gateway Soekarno-Hatta International Airport on the western outskirts of Jakarta as well as a new international airport being built near Bandung. Luhut Binsar Pandjaitan, the coordinating minister for maritime affairs whose responsibilities include the transport ministry, revealed the possible expansion recently to The Nikkei and others. The proposal will be finalized over the next month or two, said Pandjaitan, a close aide to President Joko Widodo. The railway serves as the centerpiece of Widodo's campaign promise to invest $450 billion or so in infrastructure development over five years through 2019. But two years after the January 2016 groundbreaking, construction has practically halted due to obstacles in land acquisition. Prospects are dim for launching service in 2019 as planned. Widodo's government wants to show progress ahead of the presidential election in 2019, even if it means rewriting the original plan. But Pandjaitan assured that the plan remained underway, denying any possibility of scaling down or calling off the project. Years of talks between Tokyo and Jakarta about introducing high-speed rail in the Southeast Asian country fueled expectations that the contract would involve Japanese shinkansen trains financed by a low-interest yen loan. But the tide changed when Widodo took office in October 2014 and adopted a policy to halt increases in public debt. As a result, a Chinese proposal requiring no funding guarantee from Jakarta eventually won the contract.